Not for the first time this season, the destination for my latest fix of groundhopping action was determined by the outcome of a Twitter poll. In fairness, my initial intention had always been to go to the game that would go onto win the vote anyway – Bexhill United vs Steyning Town. 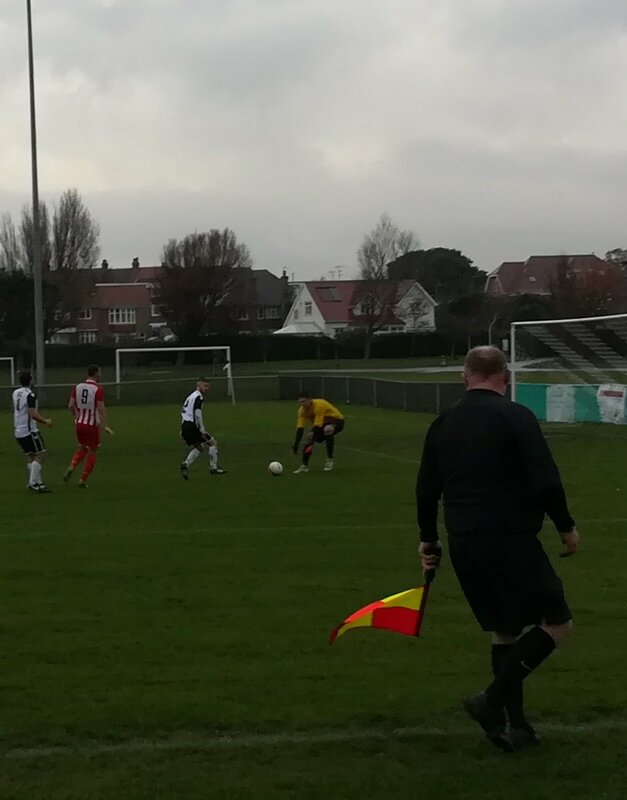 My attention had first been alerted to the fact that there was a top-of-the-table clash going on in the second tier of the Southern Combination Football League this weekend by my Saturday morning coaching colleague (and Steyning player) Joe Fitzpatrick seven days ago. 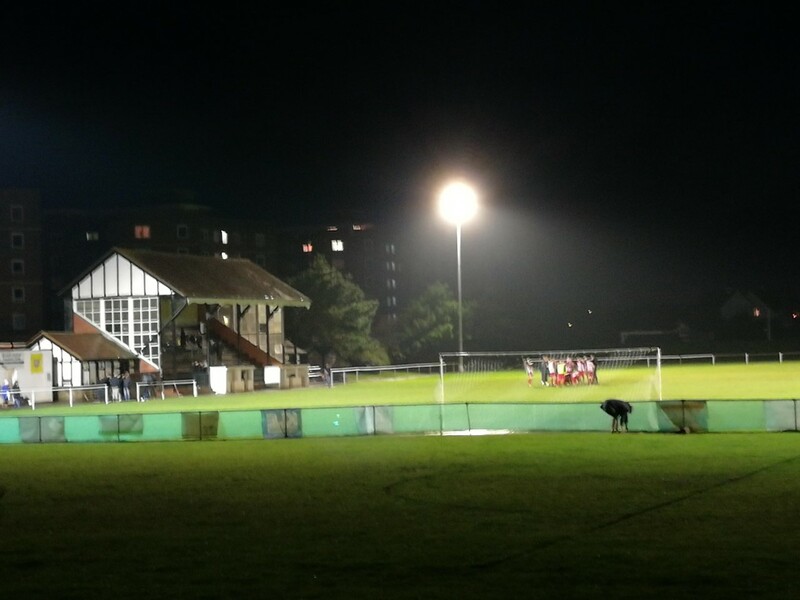 However, by Wednesday evening I still hadn’t 100 per cent settled on making Bexhill’s Polegrove Ground the venue for my upcoming Saturday outing. The fact that I’d already seen both teams in action at various points this season, while there are still a number of number of teams with which I’m yet to have the pleasure of watching, left me slightly unwilling to commit. There was only one thing for it. A Twitter poll featuring this game, and then a couple of other matches where I hadn’t yet seen either of the teams involved. I was obviously destined to be at the Polegrove this weekend, though. My Twitter followers comprehensively voted for me to attend this match. So on a wet, yet surprisingly mild, Saturday afternoon, I headed east to the seaside town of Bexhill. Now, somewhat bizarrely, while this was my first ever trip to Bexhill’s ground, it’s actually the second time I’ve watched The Pirates at home this season. Back in late September, I travelled to Southwick FC’s OldBarn Way to watch a game that had been switched to that ground due to ongoing ground works at the Polegrove. On that occasion, Bexhill had run out fairly comfortable 3-0 victors. 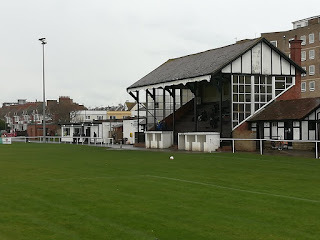 However, having also seen Steyning in action this season, towards the start of their FA Vase run (a run which they are still on; best of luck next week, guys) I was well aware that the hosts were unlikely to have things so straightforward in this match. The Polegrove must be one of the UK’s closest located ground to the sea. It’s literally right off the seafront! Parking was unproblematic – there was plenty of space on the outside road despite the fact I arrived there fairly close to kick off – and at just £4 the admission price was the cheapest I’ve encountered to date. There was also a fine program for £1, which was much improved on the thrown together issue that was on offer at their home game in Southwick (although this was reflected by the fact that there had been no charge for the program on that occasion). Given the persistent rain which had already drenched me once during my morning coaching commitments in Brighton, I immediately earmarked the stand as the perfect location under wich to take shelter for the afternoon. However, upon making my way into the stand I found that my view was slightly obscured and that there were parts of the pitch that I couldn’t see as well as I would have liked. I instead decided to brave the rain. Well, kind of. I actually decided to seek refuge from the elements by pressing myself flat along the clubhouse wall, where a slight roof overhang provided enough cover to shield me from the worst of the rain. 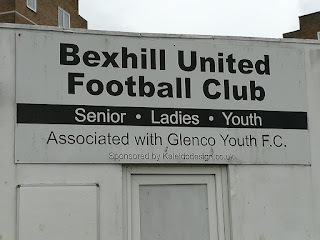 With just two places and one point separating the two teams (Bexhill went into the match in top place, courtesy of a superior goal difference to AFC Varndeanians) there was a feeling around the ground that this would be a cagey affair. And so it proved. The Pirates started the brighter of the two teams, creating a flurry of early half-chances but never really threatening JJ Baransco’s goal. 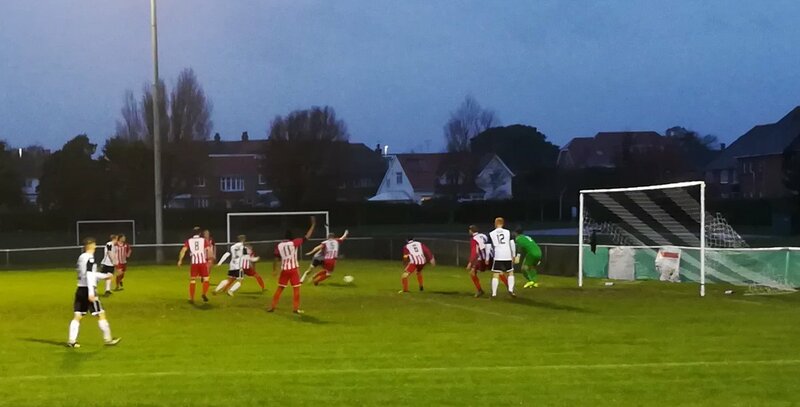 Steyning also had their moments, but again couldn’t create anything which even closely resembled a clear-cut chance. It was ultimately a costly error. 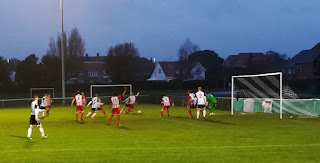 While Bexhill pressed on in the second-half, a well-organised Steyning defence held firm. It was easy to see why they have only conceded 9 league goals from 14 league matches this season. United were clearly missing the physical presence of Drew Greenall who limped off in the first half. Not that the visitors ever really looked like enhancing their lead. 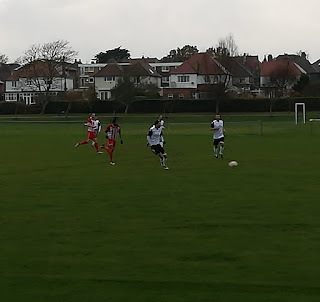 Bexhill also looked solid at the back. These were two extremely evenly matched teams which for the most part succeded in cancelling each other out. With time running out, Bexhill started to throw caution to the wind and began to get more and more men forward. 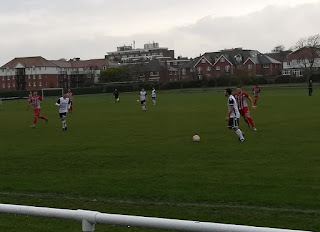 They almost snatched a late equaliser when a long-range effort from top scorer Jack Shonk clipped the top of the cross-bar. Moments later Baransco had to be alert to keep out another chance. It was the first save I can remember the visiting goalkeeper having to make in the entire game. Not that Rose was much busier. 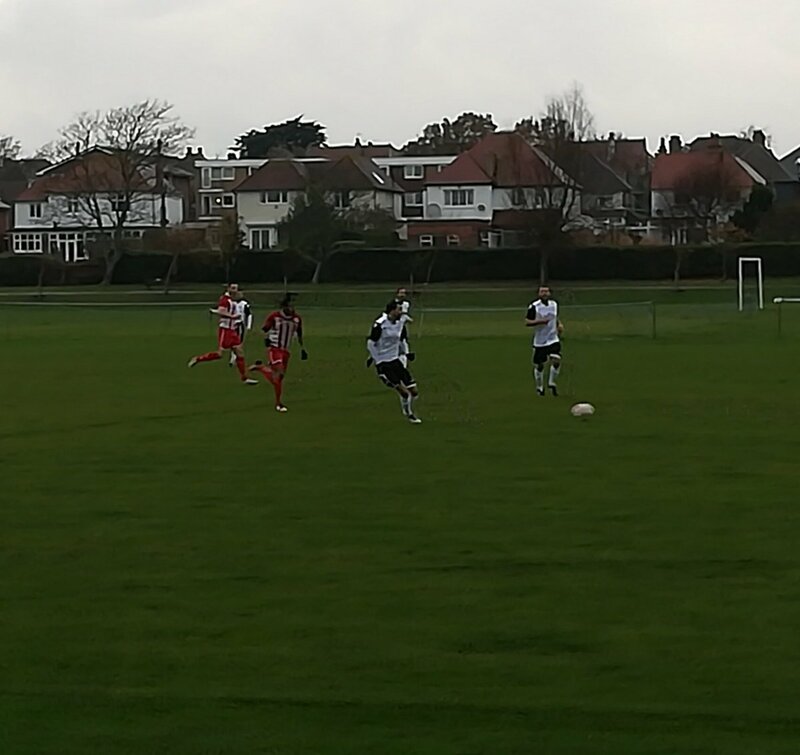 With AFC Varndeanians’ being held to a draw away at Littlehampton, the win was enough to take Steyning to the top of the Division One table for now. 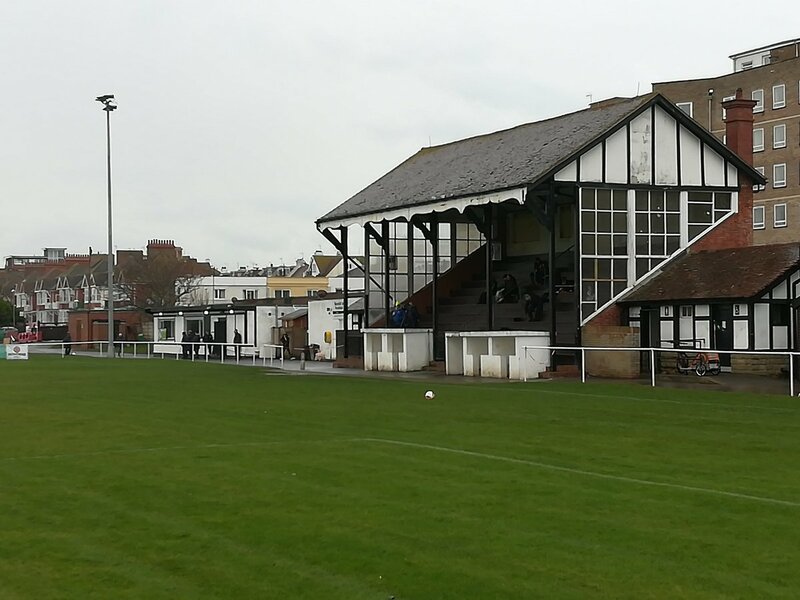 Having seen plenty of the SCFL’s Premier Division sides already this season, I can safely say that both Bexhill and Steyning could comfortably make the step-up next season. I’m yet to see the division’s other two main contenders – Varndeanians or Alfold – yet, but given the closeness of the table it’s safe to assume that there’s not much between any of the top four. A very exciting promotion race looks to be in the offing. One of the main reasons that I decided to embark on my groundhopping adventure this season was to sizably increase the number of non-league grounds that I’ve visited. So here’s a confession. 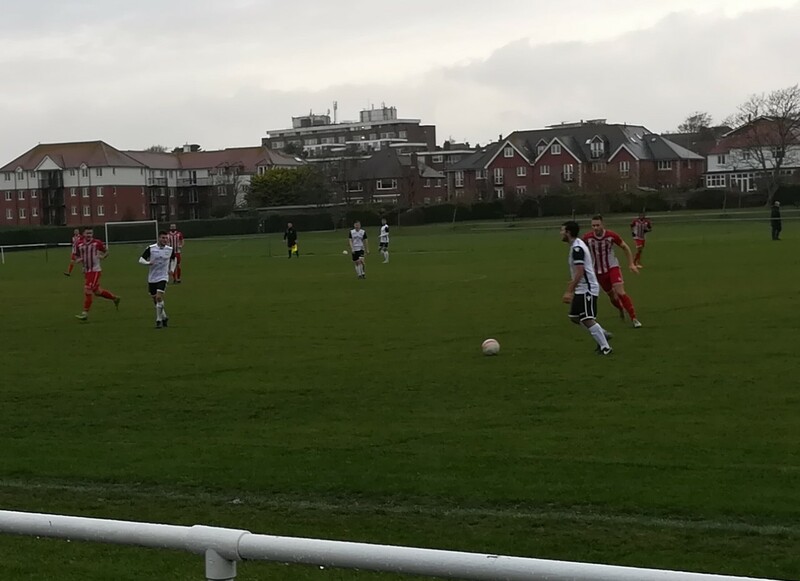 For the second time already this season, I have chosen to visit a ground that I’ve previously been to (last month’s visit to Saltdean United’s Hill Park being the other). Yet while Saturday’s visit to Steyning Town’s Shooting Field Stadium was my second visit to the ground, it was my first time as a spectator. My previous visit occurred around a year ago when I played in a Vets game for Withdean against the Steyning over 35s. That match finished in a 1-1 draw and I happened to score our goal (this last fact has no relevance whatsoever to the rest of this post, but was a fact still worth mentioning, in my opinion). When, a few months ago, the parents of the Withdean Youth team that I had coached for the past eight years clubbed together to buy me a tour of Anfield, my wife viewed this as a great opportunity to take a few days away with the kids during the summer holidays. What she hadn’t banked on back then was my new hobby of Non-League groundhopping. Therefore, with the tour booked, and our dates away confirmed, I started looking into possible matches that we could attend. You can probably imagine the better half’s excitement when I informed her of my plans. Surprisingly, however, she didn’t turn down my offer for her to tag along me and the kids. While it may only be the opening weekend of the new Premier League season, it’s already FA Cup day in non-league world. Well, lower non-league world anyway. To celebrate the magic of the FA Cup (which still very much exists for clubs at this level), I’ve decided to cross the East Sussex border and visit my first non-Southern Combination Football League ground of the new season. Albeit not by much. In either case. Based in West Sussex, but located fairly close to the East Sussex border, Haywards Heath Town were last year’s SCFL champions and will this season ply their trade at a higher level in the newly formed Bostik South East Division. This is my first visit to the Hanbury Stadium and my first impressions, as I drive towards the ground and spy the main stand (pictured), are good.